Anti-hunt campaigners were recently tipped off that hunters were assisting in promoting pro-hunt Conservative MPs in the run up to the election in June. 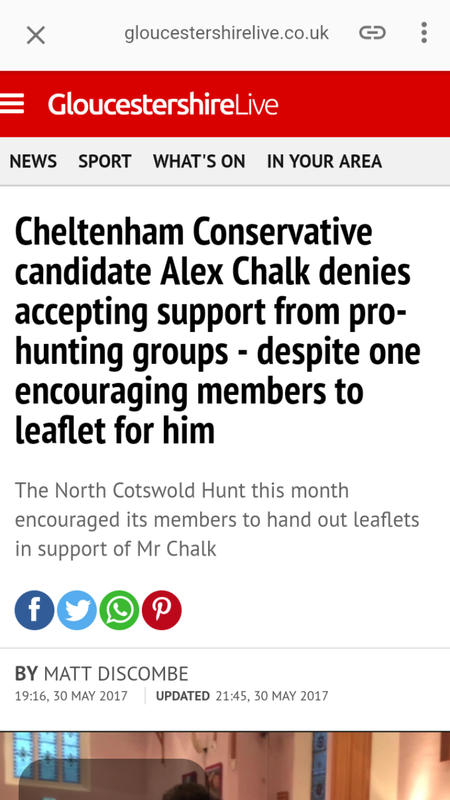 One such MP is Alex Chalk of Cheltenham, although he states in this article that any changes beyond bringing the law into line with the law in Scotland would have to be considered carefully as they would be ‘highly controversial’. 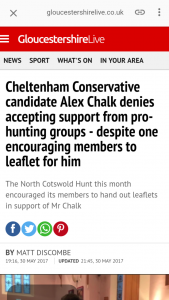 We aren’t surprised that Mr. Chalk is denying having anything to do with the North Cotswold Hunt – they’re hardly a group of people that you would want to associate with especially when trying to maintain a position of power in local community. 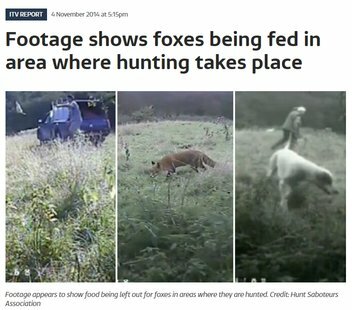 The hunt associated with the feeding of foxes in an area where they often hunt – vehicle was tracked back to their kennels in Broadway. 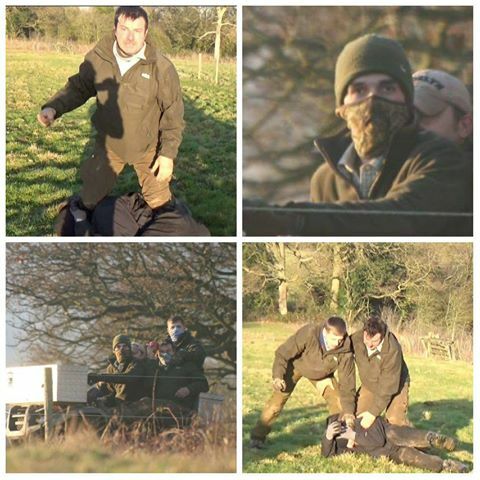 Also in 2014, we caught the hunt illegally chasing foxes despite knowing that sabs had filmed their behaviour. 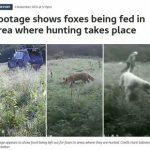 October – during a cubhunting meet near to Evesham hunt hounds ran a fox to ground. Sabs caught terriermen at an active badger sett that they had begun to dig into to get to the fox, entrances to the sett freshly blocked up. They then abandoned the terrier who had been put into the sett for 2hrs, facing off with the hunted fox and potentially the resident badgers. With no hunt staff in sight she was taken by sabs to a vet with a suspected bite to the neck with sabs subsequently accused of theft. 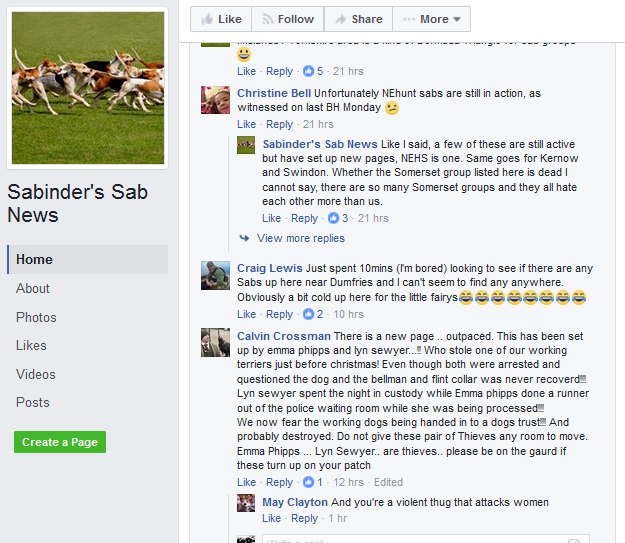 Ironically due to this allegation and arrests of sabs which followed those looking after the terrier responded by moving the terrier to a safe house and even sabs concerned no longer know her location, just that she is safe. Vet report confirms that she had been repeatedly used for breeding, that she must have lived mainly on concrete, that an old dislocation of a hip had never been set to heal properly and many of her back teeth had been broken. Additionally she is roughly 5yrs old though she looks much older. December – following the incident in October hunt staff took it upon themselves to punish sabs and the 3, unmasked, female sabs present at a meet at the end of December 2016 were driven at, sworn at and had threats of sexual violence made towards them as well as one sab being punched in the face, having her head slammed into the frozen ground and being kicked in the groin by hunt members attempting to stop them finding artificial earths which the hunt had been acting suspiciously around. 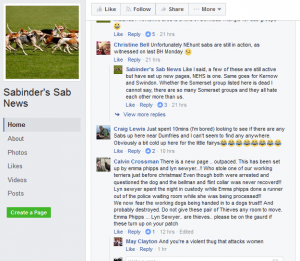 While the ‘theft of dog’ case against the sabs has been dropped due to there being no evidence that they were trying to steal the terrier, investigations continued into the revenge attacks against the sabs in December. The terrierman who had driven into a sab was given a caution for assault while Calvin Crossman, falconer, was let off for his attack on the sab. Even while the investigation continued into his behaviour, it did not deter Crossman, of Evesham, from inciting other hunt members to act in the same way towards sabs. The hunt, in general, do not stick to the law. Regardless of their views on the hunting ban, they need to remember that it is currently still illegal to intentionally hunt foxes with hounds. We’ve heard various reports over the seasons of hunts trespassing on to canal towpaths and even of hounds having to be rescued by locals when they’ve fallen into canals and are at risk of drowning. A couple of people have told us that the Canal and Rivers Trust have not seemed interested when the hunts have been reported but they seem to have been paying a little more attention recently. Keep up the good work out there!